Atlantic Fire will ensure you're prepared for those critical minutes of a fire. 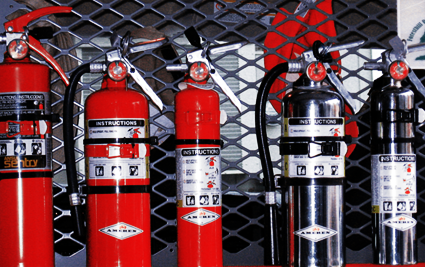 We will outfit you're entire facility with a complete and proper line of portable fire extinguishers to protect your people and property. We are state licensed and insured to best serve our customers. Contact us today for a quote! Annual service is intended to give maximum assurance that the extinguisher will operate safely and effectively. A tag is securely fastened identifying that your extinguisher is compliant and up to date. Every six years, stored pressure extinguishers must be emptied and subjected to a full internal inspection and applicable maintenance procedures, including a thorough examination of all mechanical parts and the extinguishing agent.